Editor's note: Associate Conference Minister Andy Gustafson is on sabbatical, traveling across the country. He will be visiting United Church of Christ Justice and Witness immersion centers and mission sites and blogging about what he sees. His posts about those sites will be posted here on macucc.org. His full travel blog is here: http://travelblogs.mapquest.com/32860/changing-lives-tour. The Back Bay Mission, United Church of Christ, is an exceptional mission in the midst of a community in desperate need of compassionate help. For 91 years The Back Bay Mission has been ministering to the needs of the poor in Biloxi. Losing all but one building during Hurricane Katrina, Back Bay is fully back. A major emphasis of Back Bay Mission is housing and homelessness. The hurricane recovery programs are now winding down, not because there is not more work to be done, but because the monies raised for Katrina recovery have now been all spent. Back Bay is now returning to the pre-hurricane program of housing rehabilitation. This allows poor and low income families to save their homes and avoid homelessness by performing repairs they could not otherwise afford. I had the pleasure of talking with Bob DiGiacomo, the Assistant for Housing Recovery at Back Bay. Bob became involved in housing recovery after losing own his home in the hurricane. He now works with the many church mission teams who come to Back Bay Mission on work trips. The church mission trip component of Back Bay’s programs shows their depth of experience and commitment to making sure the experience is transformative. On the evening I arrived, a high school youth group from Community Congregational, UCC in Pullman, Washington had just checked in. Every four years the church does a major mission trip so that every youth group member gets the chance to go on at least one. This is their first trip to Back Bay. Back Bay has many churches who return year after year. The program gives participants several opportunities to serve and to grow. This includes the physical work of rehabbing someone’s home and serving at the Micah Day Center which serves homeless people by providing showers, laundry, computers, and access to clothing and other services. There are chances to make relationships with people who are served there, a chance to reflect on Jesus’ call to compassion and justice and a chance to meet people from other churches. 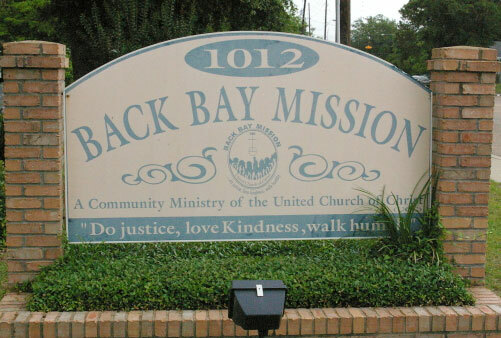 Back Bay Mission is not only serving the needs of the poor in Biloxi, it is also serving the needs of congregations to expose their youth and adult members to transformative experiences which will stay with them throughout their lives. In this way Back Bay is helping congregations make disciples who will change the world. Back Bay Mission has recently launched a program to provide housing for homeless veterans. This is in addition to their “Home at Last” program to move the chronically homeless to permanent housing. Back Bay Mission relies on gifts from congregations and individuals from around the U.S., grants from both government agencies such as HUD and Veteran’s Affairs and other grant makers. They work in partnership wherever possible with other non-profits, businesses and agencies. Last year they partnered with the Hard Rock Café Casino to provide a Thanksgiving Day meal for the homeless and hungry. This was so meaningful to the casino employees, that there are more volunteers than can be accommodated. In addition to church mission groups, Back Bay also has arrangements for long-term volunteer assignments through the UCC Volunteer in Mission program. These volunteers may come for periods of a few months to a year. Kenny Washington was a director of hurricane recovery services for the Red Cross. As they started to wind down their recovery programs, Kenny found a new home at Back Bay as Director of Client Services. Kenny testified to how every day they are making a difference in people’s lives. There is a strong effort to help people find employment. Classes are taught on interviewing and resume writing. There is an upcoming job fair. They provide appropriate clothing. The Micah Day Center is a one-stop service hub for the homeless, where they can meet with state unemployment assistance and other service providers. Back Bay Mission has an excellent website. To learn more go to www.thebackbaymission.org or friend them on facebook www.facebook.com/BackBayMission .